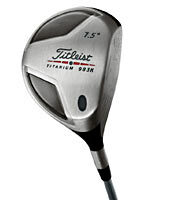 Titleist’s Titanium 983K is the season’s hottest driver. When Ernie Els popped a 376-yard tee shot with it in the PGA’s maiden event of ’03, pros and hacks alike dropped their jaws in unison—then scrambled to get their own ($500; 888-324-4766; titleist.com). And while most of us will remain firmly on this side of 300 yards, the 983K should at least edge us closer to Ernie country. Four local courses you shouldn’t take for granted.